Delay or interruption of the conduction of impulses from the SA node along the normal pathway to the ventricular myocardium results in heart block. The SA node produces impulse at the rate of 70-80/min. Velocity of conduction in the atria is 1m/sec. It is 0.2m/sec in the A-V nodal tissue and 4m/sec in the purkinje system. The A-V node being less conductive, there is a delay of 80-120m/sec, at this level. 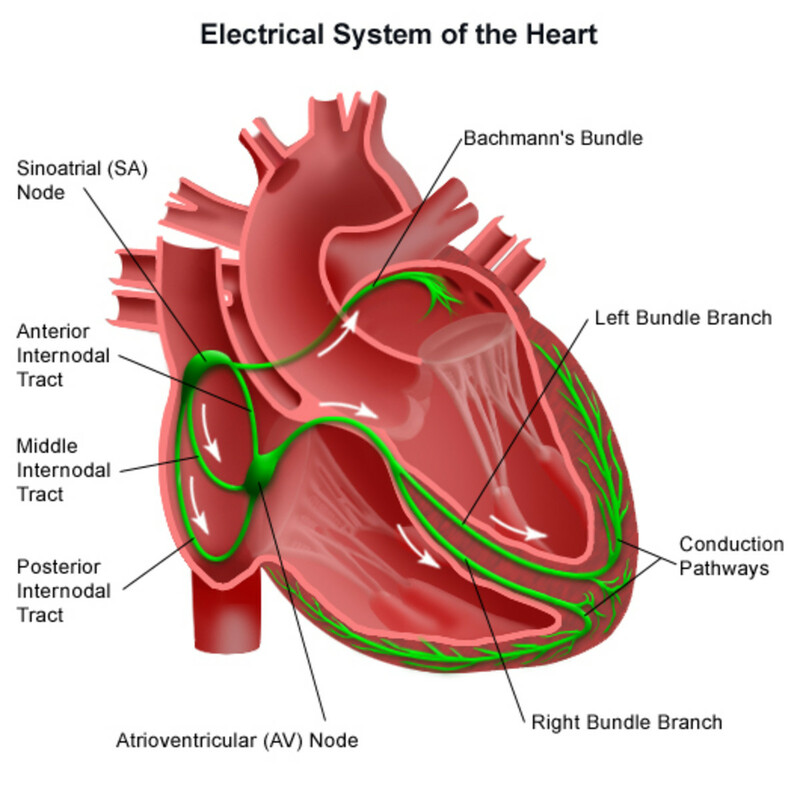 Heart block can be caused by abnormalities of impulse production at the SA node, or conduction ate the sinoatrial junction, A-V node of the bundle of His and its branches. Sinus arrest is a condition whereby the sinus node ceases to produce impulse. Sino-atrial block: Impulses arising from the SA node are blocked at the junction of SA node with the atrial musculature and hence the beat is missed. The ECG shows the total absence of the PQRST complexes, corresponding to the missed impulses. 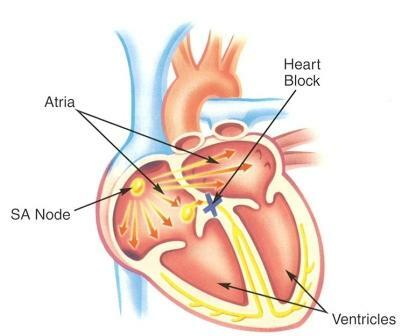 Atriventricular block (A-V block): This is caused by abnormalities at the A-V junction or along His-Purkinje system. Three forms may occur. First degree A-V block: Clinical detection of this form may be difficult. The ECG shows prolongation of P-R interval exceeding 0.2 sec. Second degress A-V block: This block is of two types. 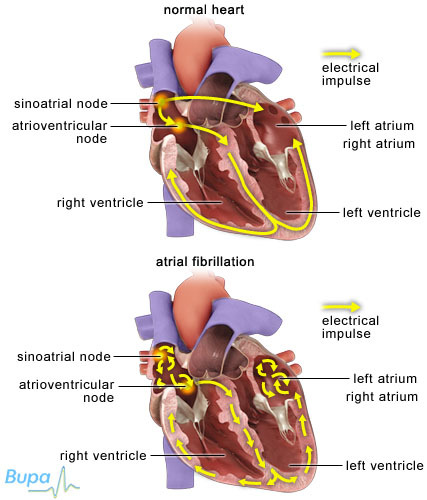 In both the types, some of the impulses from the S-A node fail to reach the ventricles, resulting in dropped beats. Mobitz type I block (Wenckebach phenomenon): The P-R interval increases progressively till a QRS is totally missed. This is clinically evident as a regular irregularity. Almost always this is caused by a block in the A-V node. Mobitz type II: This is a more serious arrhythmia than type 1. The P-R interval of the conducted beats is fixed, but some of the P-waves are not conducted to the ventricles and are not followed by QRS. The P-waves out number the QRS complexes. Mostly this is due to a block in the His-Purkinje system and more often the QRS may show some widening. Third degrees heart block (Complete block): In this condition, impulses from the SA node are totally interrupted from reaching the ventricular muscle. The ventricles respond to impulses produced by the A-V junction or areas distal to that. When the impulses arise from the ventricles (idioventricular rhythm), the rate is usually less than 40/mt. The ECG shows regular P-waves occurring at 70-80/min and QRS complexes are usually bizarre occurring at a rate of about 30/min. There is total dissociation between the P-waves and QRS complexes. The pulse is regular in established complete heart block because the QRS complexes are produced regularly. Primary degeneration of the conducting tissues. Diseases affecting the myocardium: Myocardial infarction, chronic coronary artery disease and myocarditis. Drugs and toxins: Digoxin, quinidine, procainamide, beta adrenergic blocking drugs, cerbera thevetia and cerbera odollam. Trauma to the conduction tissue during surgery. Congenital abnormality of the conducting tissue (Congenital heart block). Infection: Tertiary syphilis, south American trypanosomiasis (Chaga’s disease) and cysticercosis. These are the various stimulators of Heart block. With this, we can adequately understand and also try to prevent the occurrence of heart block. Nice and informative hub married2medicine on the most important muscle in the human body. However, I would suggest maybe explaining a little more in detail in layman terms. The average person not in medicine/healthcare has no idea what a SA node is. Just a thought, voted up on your hub though.